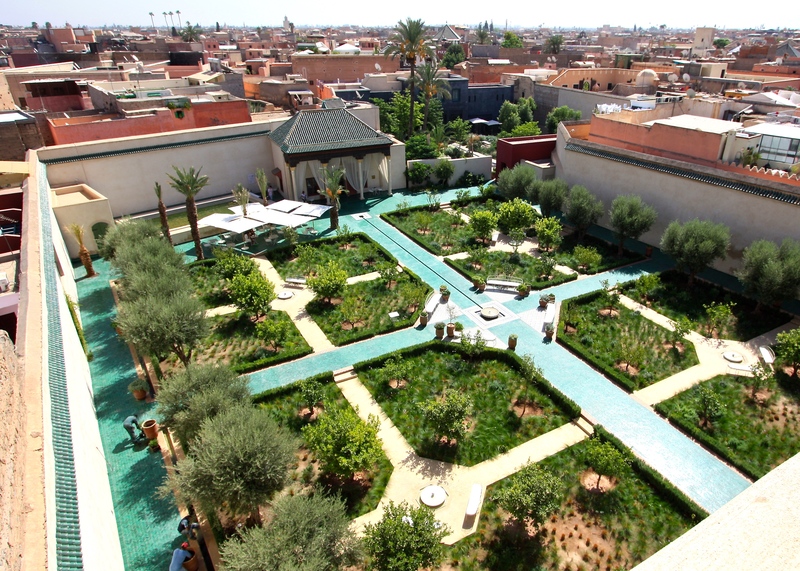 To create a new garden and open it to the public in the space of three years would be a challenge for the most determined of garden designers, but to achieve it in the dry heat of Morocco, in the heart of Marrakech’s labyrinthine souk, is an achievement of a very different order. 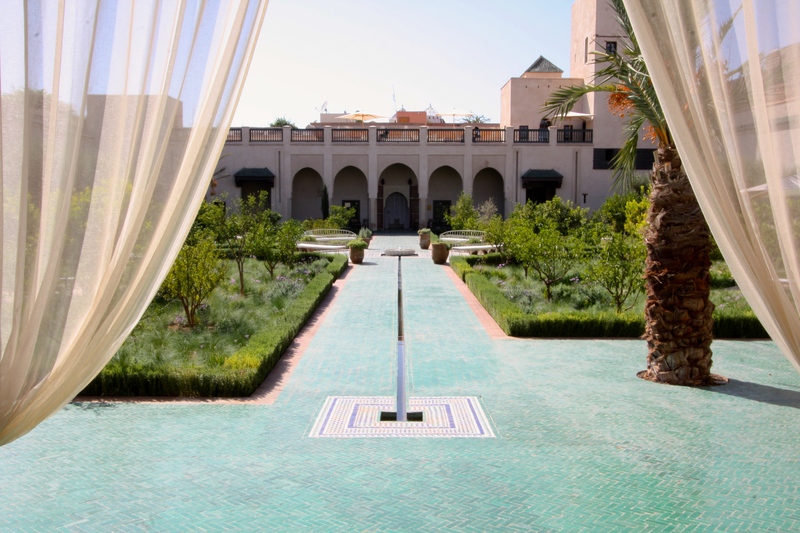 The team behind Le Jardin Secret have achieved the seemingly impossible by reviving and reimagining one of the Medina’s largest and most important gardens. The result is a triumph, not only for the city, where it will surely become a major tourist attraction, but for Islamic garden design in the wider context. 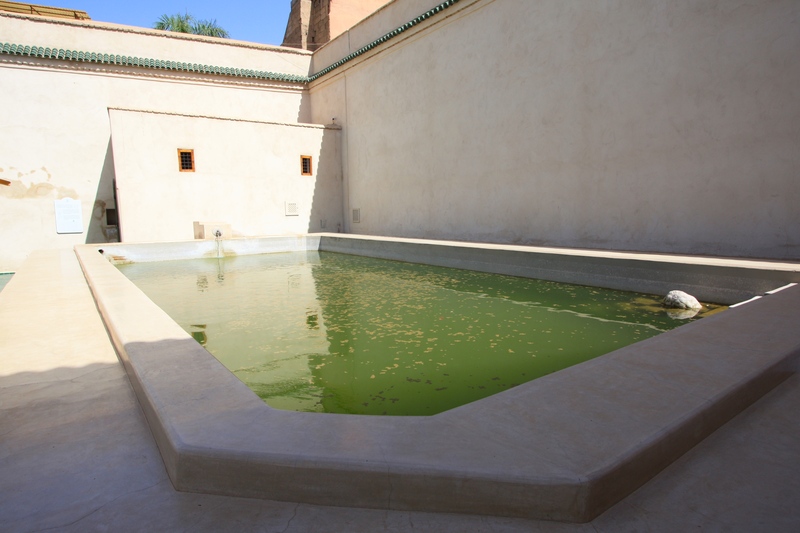 There has been a riad* on the site of Le Jardin Secret since the 16th century, when the neighbouring Mouassine mosque and fountain were created by Sultan Moulay ‘Abd-Allah al-Gālib’. This first riad of palatial proportions did not survive; what we see before us now is a restoration of buildings and gardens constructed in the middle of 19th Century. In 1912 the palace passed into the ownership of a watchmaker and chamberlain to Sultan Moulay ‘Abd-al-Hāfiz’, called al-Hājj Muhammād Loukrissi. It was during a short period of about 20 years that the property developed into the layout we can enjoy today. Loukrissi lived in the palace with his three wives, all former slaves, and numerous offspring. He possessed a remarkable collection of clocks and spent every afternoon in an ornate wooden kiosk in the centre of the Islamic garden, making fine watches. Following his death the garden fell into a state of neglect. From 1934 to 2007 the site was divided between descendants of the last owner, over and over again, until 130 distant relatives could lay claim to the property, some possessing just a few square metres. 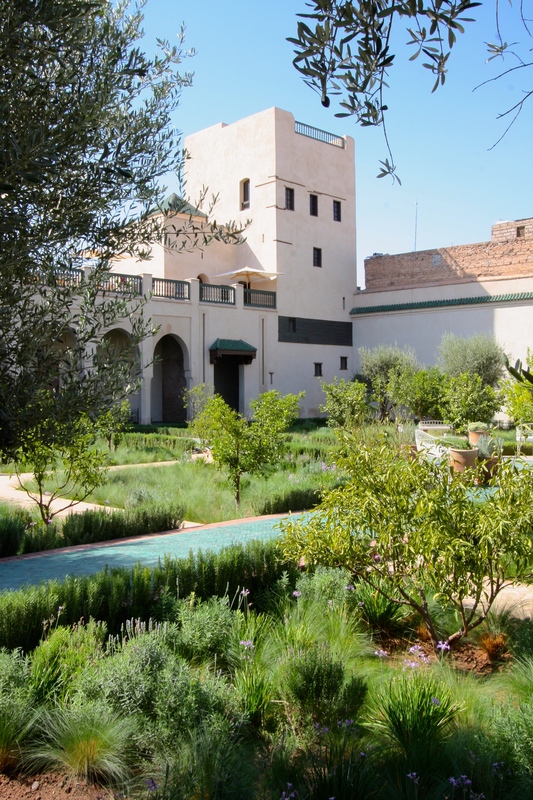 The once magnificent riad and its lush enclosed gardens amounted to little more than a few squalid buildings, rutted earth and a handful of resilient date palms. 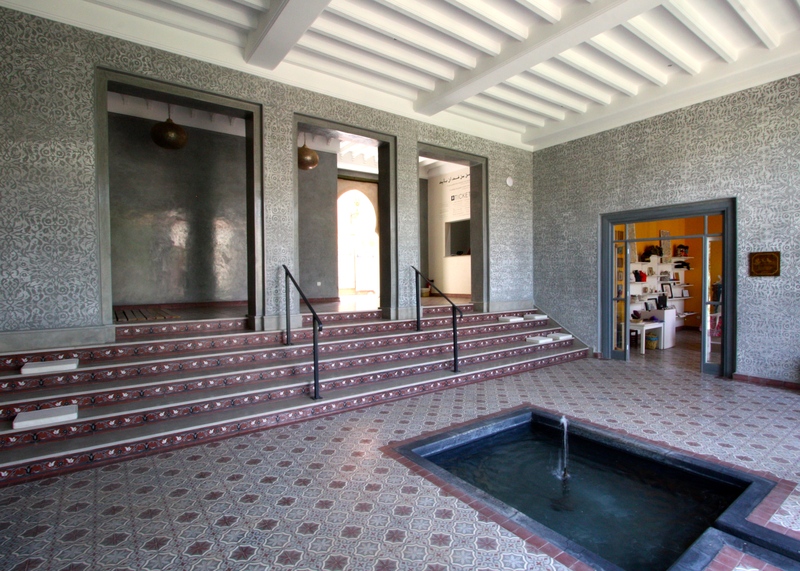 Not a moment too soon, along came an Italian couple with the vision and resources to save the palace and its courtyards for the people of Marrakech. In the talented project team recruited to revive the riad is a name you will immediately recognise – Tom Stuart-Smith, the man responsible for both the design and planting scheme for the gardens. Within Le Jardin Secret there are two very distinct gardens, both following the outline of what came before, but each with a distinct identity. The first, and the biggest, is the Islamic garden, which in most respects faithfully reflects the ideology behind such ‘paradise’ gardens. The second is an ‘exotic’ garden, which maintains a fourfold layout but plays (very successfully) with plants that would not have been at the disposal of the garden’s previous owners. Returning to the Islamic garden, Tom Stuart-Smith has taken great care to create a new garden that both looks and functions like the original. To begin with it adopts the symbolic fourfold plan, known as the chahar bagh, which has featured in Persian and Islamic gardens since c. 500BC. Originally such gardens were divided by narrow channels for the purpose of irrigation, but in time the presence of water also came to represent wealth (access to running water in dry countries was a great luxury), purity and renewal. In addition the sound, sight and cooling quality of water brought peace and tranquility to a garden. During Loukrissi’s time the water supply for Le Jardin Secret would have risen far away in the Atlas Mountains, flowing via a series of pipes and tanks to the neighbouring mosque, and then onwards into his two compounds. That mechanism having long since failed, the water filling the garden’s open tank is now drawn from a deep well. Yet the system feeding the various rills, basins and marble fountains is still just as fine-tuned, using gravity rather than pumps to keep everything running smoothly. In all traditional Islamic gardens the paths and watercourses that divide the space are set higher than the planted areas so that water can spill down and thus irrigate the trees and flowers. 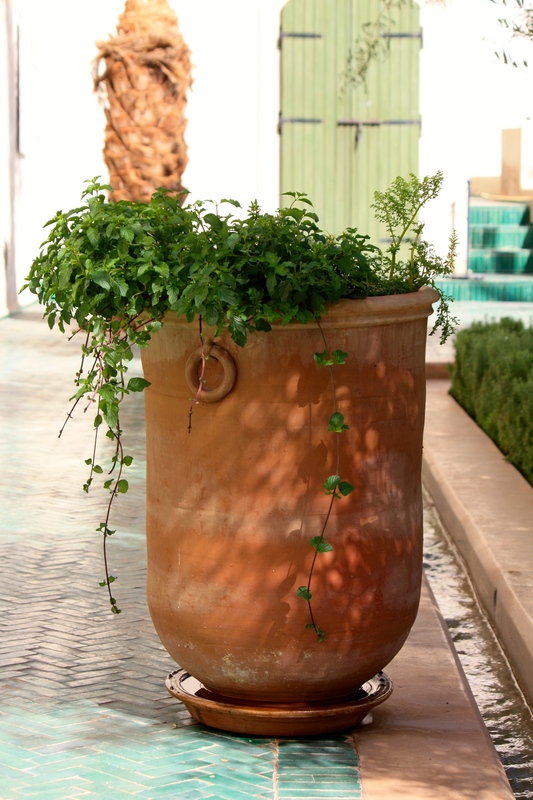 This solution to watering is as delightful as it is practical. During the garden’s restoration, 19th century construction techniques were used as far as possible. Where old meets new differences have been deliberately highlighted. 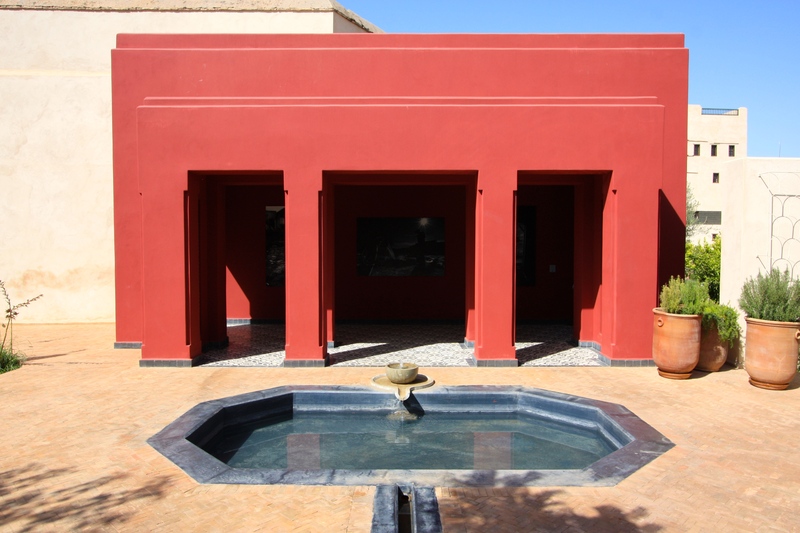 Tadelakt, a traditional Moroccan waterproof plaster, has been used in rough form on the surface of walls. The sand that’s bound into the plaster contains mica, which oxidises over time, causing buildings to change from buff to the familiar salmon-orange we all associate with Marrakech’s cityscape. I fell in love with (and it seems many of you have too) the sea-green tiles in the Islamic garden. These were fashioned from terracotta, glazed and fired, before being laid in a herringbone pattern to form the main pathways. The colour matches exactly old tiles found on the staircase of the tower. Elsewhere the paviours, known locally as bejmat, are used in an unglazed state, lending a wonderful softness to the hard landscaping and preventing it from dominating. The paths which converge on the central fountain are edged with faux bricks that have been scratched into clay and then painted, just as they were in Loukrissi’s day. The marble basin itself is surrounded by thousands of smaller tiles called zellij glazed in emerald-green, sapphire-blue, mustard-yellow, black and white. Any Islamic garden that’s true to its deep roots must feature a quartet of trees including the olive, pomegranate, fig and date. Some say the olive could be the Tree of Bliss mentioned in the Qur’an: its oil has long been considered sacred (it even features in the Coronation ceremony for British monarchs). Pomegranates represent unity, wholeness and fertility, whilst figs were deemed a fruit of paradise by the Prophet Muhammad. 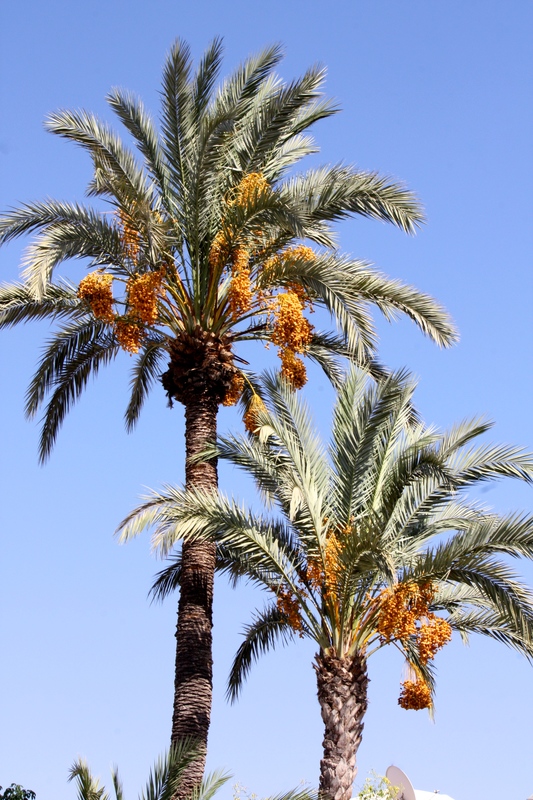 The date is regarded by Muslims as one of the blessings that will be offered in Paradise and the fruits are eaten to break the fast at the end of each day of Ramadan. Tom’s design also includes other trees and plants of symbolic importance in Moroccan gardens, including Argan (Argania speciosa), prized for its oil; grapes (Vitis vinifera), used for fruit and winemaking; and oranges, both sweet (Citrus sinensis) and bitter (Citrus aurantium), introduced to the Mediterranean from China between the 6th and 8th century. The gardens would be nothing without the buildings and walls encircling them. I was surprised by the relatively modest scale of Loukrissi’s living quarters considering he had such an extensive family. Anyone with a romantic bone in their body will be swept away by the vision of the Hbiqa** pavilion, built for one of Loukrissi’s wives, its gauzy curtains billowing in the slightest breeze. Oh! to lie there on a quilted divan, being fed grapes, gazing out on my own little paradise. Bliss! The tower that dominates the Islamic garden is part of the accommodation used by Loukrissi and his wife Oud el Ward (meaning ‘Rosewood’). At 17m it equals the height of many of the city’s mosque minarets and would have been a significant expression of wealth. The upper rooms would have been used to conduct audiences with important guests and an opening in the roof allowed smoke signals to be sent to other members of the city’s elite during times of trouble. The views from the top are both breathtaking and fascinating. In the exotic garden a new pavilion has been created on the foundations of an older building. The significance of this structure is that it provides the one and only route between the two gardens, deliberately hiding one from the other. This offsetting of spaces was commonly used in Islamic gardens to ensure the privacy of the owner and his family. 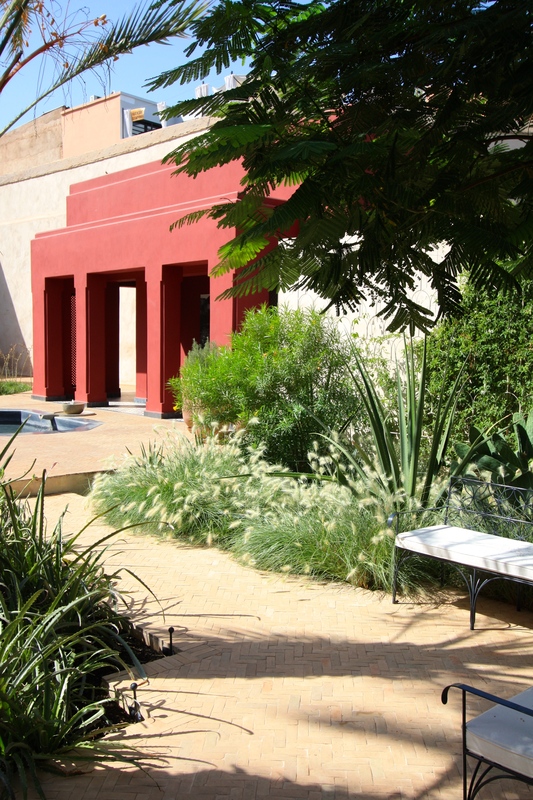 Striking red paintwork provides a dramatic contrast to the cool greys, silvers and greens of the planting. But for me the new visitor building, through which one enters the garden, deserves the most praise, offering tantalising glimpses from the street and a cool and stylish transition between the hustle and bustle of street level and the dazzling garden below. 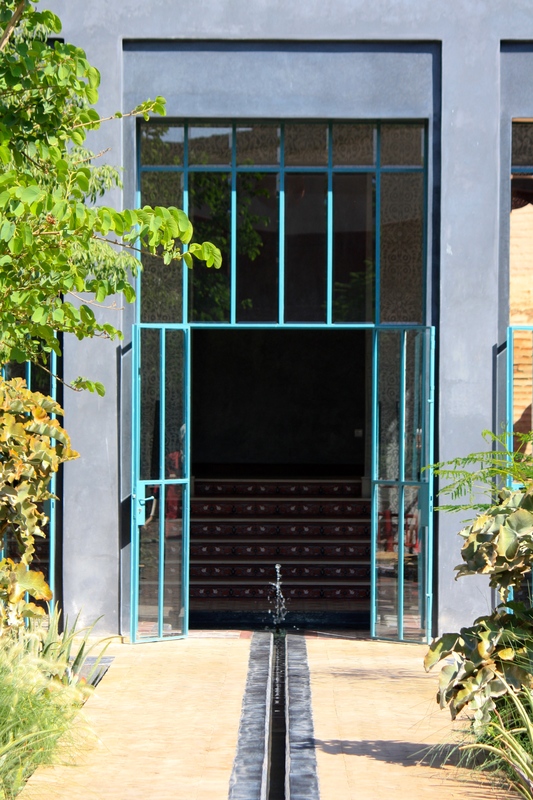 The building has almost Bauhaus sensibilities with its steel windows and elephant grey exterior, but elaborate floor tiles and detailed plasterwork plant this building firmly in Moroccan soil. Whilst it’s not possible to compare the two gardens directly, I will to confess to enjoying the Exotic Garden more, from an inspiration point of view. The powerfully structural forms of opuntias, kalanchoes and pachypodiums, mixed with bristling bulbines and dasylirions are softened by grasses adopting autumnal hues. There is no angle from which the Exotic Garden is not deeply pleasing, even soothing. 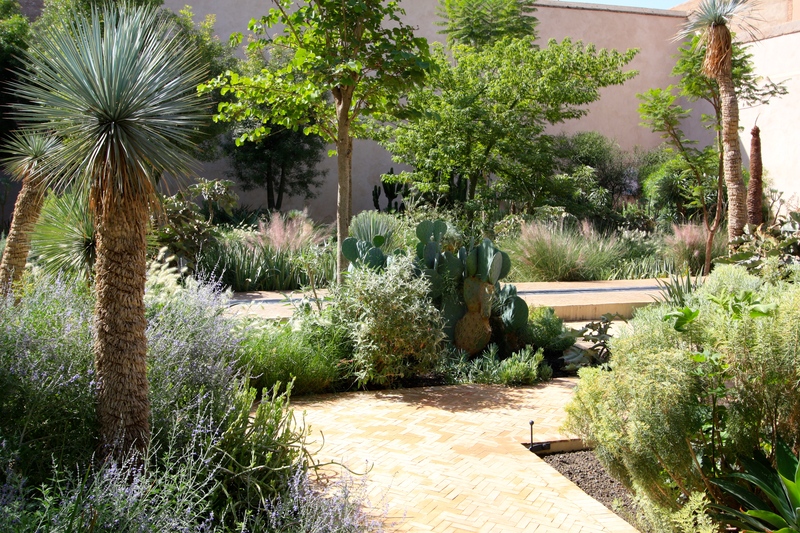 Tom Stuart-Smith has chosen drought tolerant plants to minimise the amount of watering required. Many of these hail from South Africa, Australia, Mexico, Madagascar, the Canary Islands and surrounding Mediterranean nations, rather than from Morocco. Succulents such as Senecio mandraliscae (blue chalk sticks), Opuntia robusta (wheel cactus) and Kalanchoe beharensis (velvet elephant’s ear) provide lots of interest but need the airy effect of the grasses to make this a garden rather than a recreation of a desert scene, of which nearby Jardin Majorelle is a little guilty. 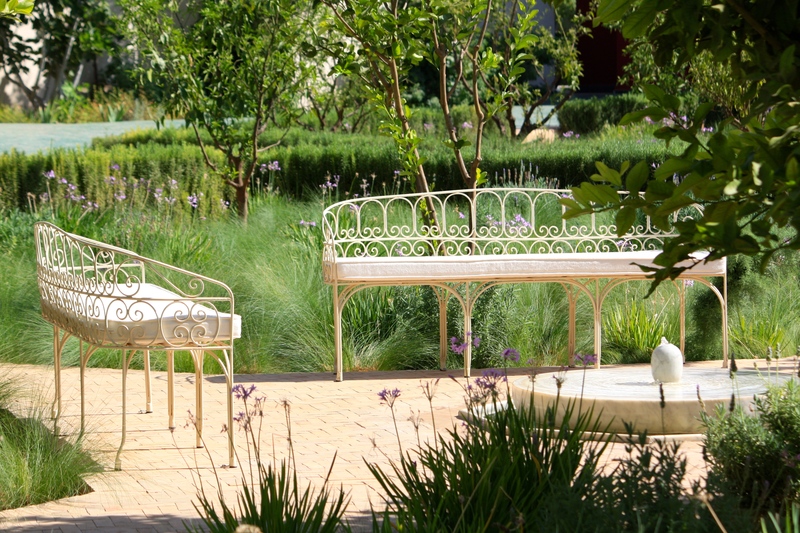 Delicate seating solutions have been contrived for both gardens, making them lovely locations in which to sit and contemplate the achievements of the project team. The garden is a masterpiece of restoration and garden design in a unique and fascinating location. Given it’s only been open for six months Le Jardin Secret is quite staggeringly beautiful and will hold you there for many happy hours if you have time to spare. The thing I love most about Marrakech is the contrast between the dusty maelstrom of the mercantile alleyways and the cool refuge of the riads with their trickling fountains, fragrant flowers and tweeting birds. This garden takes that contrast to a new level, and with time it will only grow in quality and subtlety. 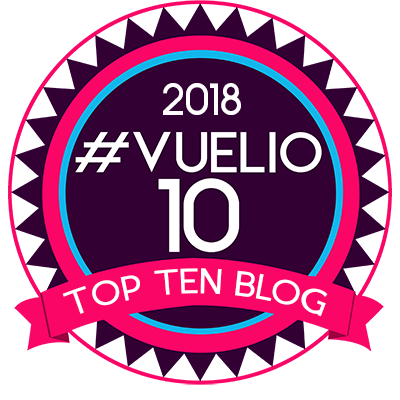 I have no doubt that once the tour operators and guide books catch up – and shame on them for being so slow on the uptake – Le Jardin Secret will be packed with as many camera toting tourists as Jardin Majorelle. My advice is to get there before they do. Nothing in Marrakech’s bewildering souk is especially easy to find, and as a tourist attraction Le Jardin Secret is not yet well-known. Fortunately the entrance to the garden is off a relatively significant thoroughfare, Rue Mouassine, and close to the famous Mouassine mosque. Large green banners mark the otherwise well-disguised entrance. At the time of writing entrance to the garden is 50 Dirhams, approximately £4. If you plan to return another day the friendly staff at the ticket kiosk will mark your ticket so you don’t have to pay again. To climb the tower, which I highly recommend, is another 30 Dirhams, but includes an expert guide who will give you invaluable information about the sights visible from the top. I have a huge dislike of heights, but the walls around the top of the tower are high and solid, whilst offering superb views. It is very much worth the easy climb. Hats are provided ‘gratis’ on the rooftop and I’d suggest wearing one if you are planning to spend any length of time in direct sun. There is a small café in the Islamic gardens serving light refreshments under chic white umbrellas. Another is set to open above the Oud el Ward pavilion in the cooler months from October to March. 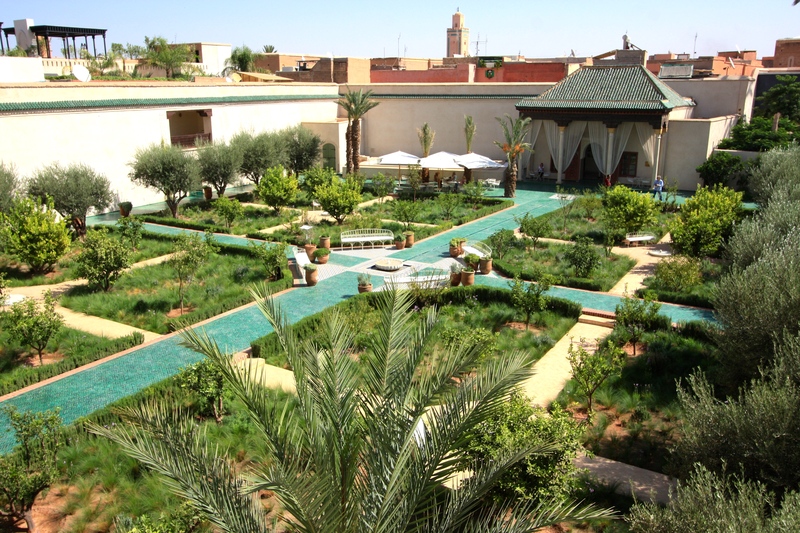 The prospect of sitting there with a cold glass of wine or freshly squeezed orange juice, looking down at the peaceful garden and listening to the birds singing is enough to tempt me back to Marrakech again soon. There is also a small shop selling tasteful arts and crafts near the entrance. For more details, visit the garden’s website. The guides at Le Jardin Secret speak both English and French very well and are eager to help visitors interpret all aspects of the garden. For an in-depth account I would strongly recommend buying the official guide book, written by Tom Stuart-Smith, from which much of what I have written was drawn. 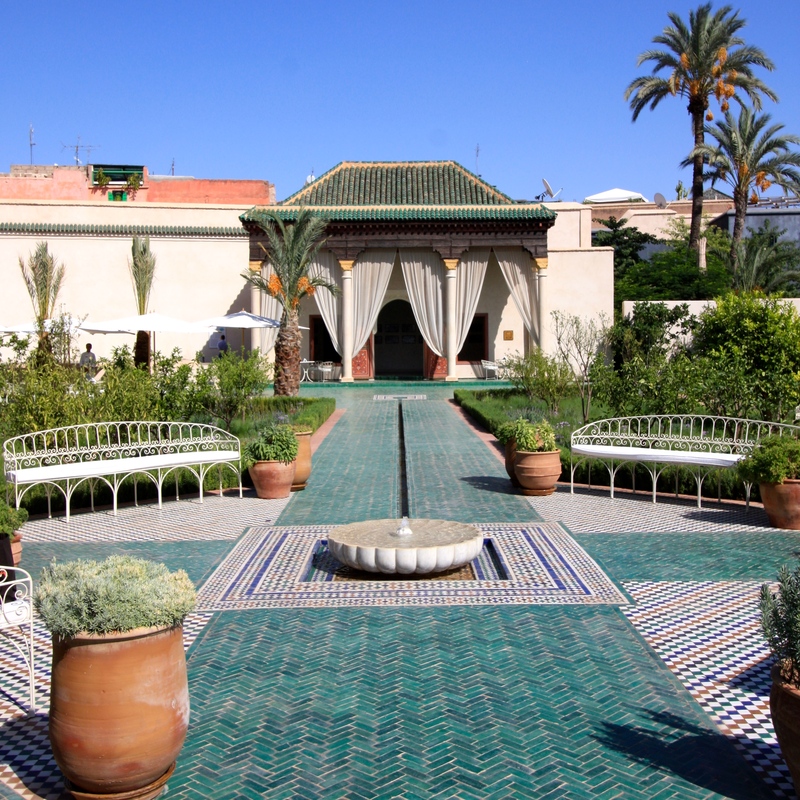 *riad is the Moroccan word for a house built around a central courtyard. **all of Loukrissi’s wives were black or white slaves and were named after plants or flowers. Hbiqa, the name of his second wife, means ‘basil’. Wow!! How exciting!! My sister’s house overlooks the gardens, and she keeps mentioning an Italian guy who has been building fabulous gardens . . I didn’t really pay much attention to her . . and she never mentioned Tom Stuart Smith! Stupid me!! You must visit your sister immediately!! We were very envious of the properties that had views directly into the gardens. Most of them looked very swish indeed. Lucky sister I’d say! Many thanks for an excellent analysis of this lovely new garden. I had not seen photos from the tower before and, with your descriptions, it’s now much easier to understand the layout and rhythm of the garden. Is it time to hail Tom as one of the 21st century’s greatest designers? It seems there’s nothing he can’t do. For a designer to create a successful garden beyond his own native territory and natural boundaries is always a sign of genius in my view. I was very impressed. The only disappointment was the infill planting beneath the orange trees which was struggling in places, I’d suggest because of uneven irrigation rather than anything else. I neglected to discuss the clever transition between the two gardens which could have been awkward but was very well conceived to preserve the ‘big reveal’. So lovely…I am lost for words, really! Congratulations, I look forward to seeing how it looks when I visit next year. Thank you ever so much Dan. I hope other people will be visiting this garden and posting their pictures and impressions as I am very unlikely to visit it. I would love to see how this garden matures. You are both such great writers, it is pure pleasure to read what the two of you write and how you write it. Thanks Barbara. The garden was so quiet both times we visited we could hardly believe it. Seems it just isn’t on the tourist trail yet, but it soon will be I’m sure. In contrast the Majorelle Gardens were too busy to be properly enjoyable, but they are still beautiful. I aim to write about them shortly too. Wow, it has grown so much. Glad you enjoyed it as much as I did! Yes, we both loved it. I am going to re-read your post now that I have finished mine to refresh my memory. What’s great post, so informative and beautifully illustrated. Goodness, though, it looks scorching hot. It was hot, but I can cope with dry heat. It’s the humidity that kills me. That said I am now in Delhi with heat, humidity and smog, and I am still alive ;-). Glad you enjoyed the post …. hoped you’d appreciate all the grasses. They seemed very at home in the heat, especially the pennisetums. As I was saying … It was P. villosum that caught my eye, here on the wet Welsh marches I have to keep her under cover until May before she’s fit for viewing. Just marvellous to see how plants we grow thrive in different climates without the moderate fuss. Enjoy Delhi, one of our all time much visited favourite haunts. That looks wonderful and so much better to see it without the crowds. And oh for the light! I’m feeling the progress of Autumn and could really do with somewhere like this right now! I do like a holiday at this time of year to prolong the summer! I am in Delhi right now, but it’s work, not pleasure. Nevertheless it is very hot and sunny so my Vitamin D levels remain high! Simply lovely! With rain here today, it looks even more tempting. (I could also do with some Plumeria flowers as on your Instagram…) I especially love the turquoise herringbone-patterned pathways and tiled square in the Islamic garden. Is that new and specific/ unique to Le Jardin Secret or would you find such turquoise-tiled paths elsewhere, too? Hi Stefanie. The tiles are traditional features of Islamic gardens so you would find them from Spain and Morocco through to Turkey, the Middle East and on towards Pakistan and India. I have been back into my post and written more about the tiling if you are interested. So romantic. You are very lucky to have found this beautiful place. I also love the tiles. Magic! I should have included some of my close-up pictures of the tiles as I studied them quite carefully. They were lovely, and the original colour, based on tiles used inside the tower. Hi Gill. I have been back in and added a few more photographs, including of the tiles, and some more text, so do have another read! Thanks Dan (and Gill, for “demanding” it !) for the extra pictures and explanations! I knew tiles are a classic element of Islamic gardens, but had never seen this pattern and stunning colour employed en masse before. Extra “canals” for the garden… Makes me want to plunge in :-). Also love the faux bricks – technique. I would love these glazed tiles in my own garden but fear they would become horribly slippery and shatter in cold weather. I am sure I can devise some way in which to get the look! I agree, the colour is gorgeous. Belated thanks for such a wonderful post. I’m very excited for you! I had hoped to return in March but it isn’t to be. I heard some restoration has been done at the Bahia Palace, which has very attractive courtyard gardens. Perhaps give them a try? Have a brilliant trip!